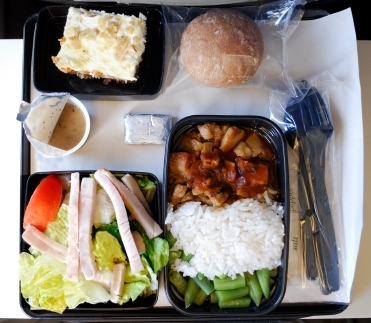 Airline food is hardly the stuff of Michelin-starred restaurants. On the rare occasion passengers are served food, the offerings are typically bland, at best, and inedible at worst. But a new study says the dining environment—stuffy, noisy planes—may be the reason these meals are so unenjoyable. For the study, researchers fed 48 blindfolded individuals an array of simple food—cheese, crackers, and so forth—while headphones either blocked out noise or pumped white noise into the participants’ ears. Researchers found that higher white noise levels muted sweet and salty flavors and amplified sensitivity to crunchiness. But it really shouldn’t surprise anyone that the environment in which we consume those reheated slabs of beef and chicken doesn’t help. The study suggests bringing noise-canceling headphones or using some other method of noise-blocking while eating. Of course, if you don’t mind the background noise, dine away; participants who liked the noise played in the study enjoyed their meals more. Perhaps chowing down while listening to your favorite music is the key? Readers, what do you think about this study? Does it even matter these days, with airline meals largely relegated to international flights and first and business class? Speaking of which, do you miss airline food? After all, it’s not like it was all bad.